Softwood deck boards which have been pre-treated to offer greater protection from the elements are an ideal choice, but how does this affect boards which have been cut to size or damaged in some way? Traditional timber decking is prone to damage from moisture, the sun’s UV rays and insect attack, while sudden changes in weather can accelerate damage further. With this in mind, regular and effective maintenance is vital to prolong the life of your decking, regardless of how long it has been in place and whether deck boards have been pre-treated. Cuts, even on pre-treated boards, soak up moisture from the environment. 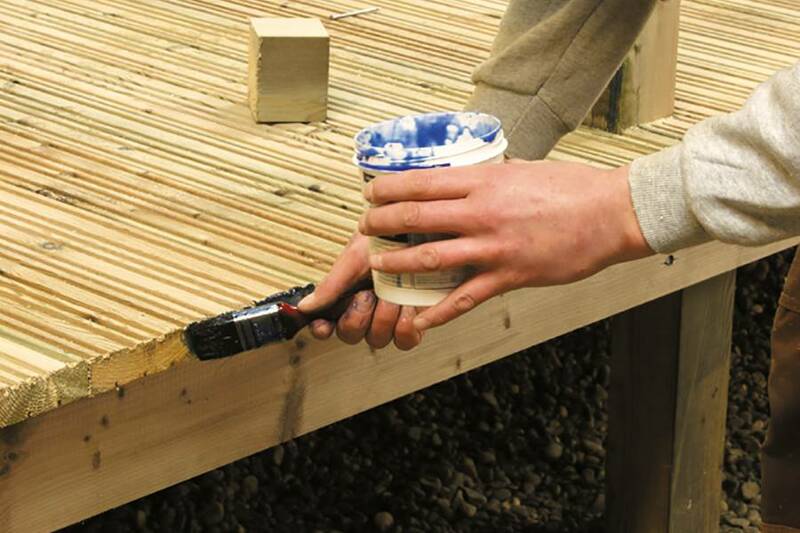 As the preservative treatment doesn’t penetrate the whole of the decking board, any small hole or cut whether made accidently, or during construction, needs to be fully treated to prevent moisture from slowly seeping in and rot setting in. A specially formulated end grain treatment can be applied quickly with a paintbrush and can act as both a sealer to stop water getting into the wood and a preservative to inhibit the growth of mould and algae which can cause decking to become slippery and unsafe over time. Several coats of the treatment should be applied to any cut ends or damaged areas, with experts suggesting up to three coats is ideal. For more advice and top tips on looking after your decking, please visit our decking maintenance page.